The Priolo’s Environmental Centre is the first Visitors and Environmental Education Center, created by the Portuguese Society for the Birds Study (Sociedade Portuguesa para o Estudo das Aves – SPEA), in collaboration with the Regional Direction of Forestall Resources and the Regional Secretary of Environment and Sea. It is located inside the Forestall Park of Cancela do Cinzeiro, at the bottom of the Serra da Tronqueira and inside of the ZPE (Special Protection Zone) Pico da Vara / Ribeira do Guilherme. This park has got an interesting plantation of native species and a small garden, representative of the natural forest species in the Azores. Even before the building of the Environmental Centre, this place was chosen for the local population walks, at weekends and holidays. The Environmental Centre is constituted by two buildings (the old forest guards house) joined by a transparent glass greenhouse. At the principal Priolo’s Environmental Centre entry, by the greenhouse, we can find the reception and the Priolo’s Shop, posters with information related to the centre and SPEA activities and a resting area annexed to the Bar where you can have a coffee or a tea and taste the island’s traditional biscuits. At the Priolo Environmental Centre main building, the visitor can see an interactive exposition that permits to knowledge about the Serra da Tronqueira, its fauna and flora, and more specifically about the Priolo, its problematic situation and the action taking place to protect this specie, trough interactive and dynamic panels. In the middle of the exhibition area, there is an area specially designed for children, with games and activities that are aimed to approach the Priolo’s problems to the youngest. The Environmental Centre auditory is destined to the realization of courses, conferences, meetings and the projection of documental films about the Priolo topics and the nature conservation. The Centre still pretends to create and receive temporary exhibitions about topics related to the Priolo, the Laurissilva and the Azores. With this idea, the space inside the Centre was thought like as dynamic area, easily modifiable. The children area walls are mobile ones and the auditory space is versatile, so it can be transformed in an exhibition zone when required. 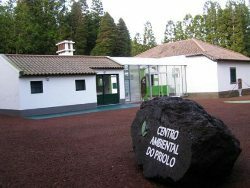 The Cancela do Cinzeiro Forestall Park will receive activities outside of the Centre too and at the Endemics Garden was created a pathway, where people can identify the Azores native species. The Priolo Environmental Centre pretends to organize different kinds of activities focussed to public in general and to local population and the schools in particular. The Centre objective is to simplify and to promote the activities that can approach the public to the nature and environment, to the Priolo habitat and, this way, guaranty its survival.